Working The Point: Kostitsyn enigma solved in Winnipeg? if I am Montreal I want more for those two players. what else are you giving me? 1. Is Montreal listed as a no-go on his modified no trade clause? Highly suspect it is. 2. Antropov would be just as unhappy playing 3rd line minutes as Kostitsyn and would have to deal with a significant cut in PP time. 3. 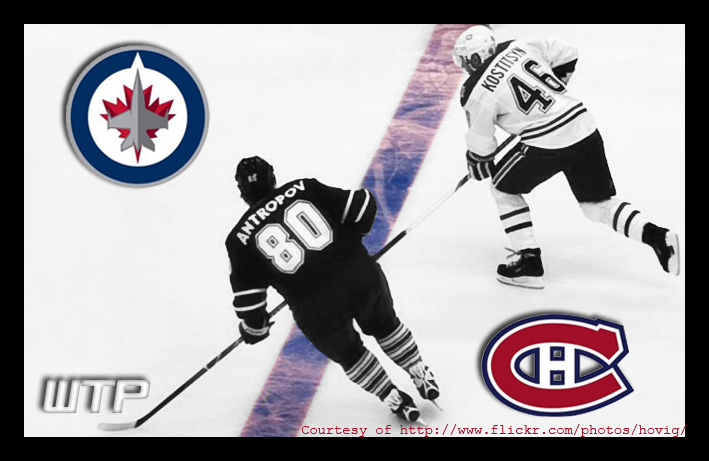 Antropov is a big player who doesn't play big. Kostitsyn is far more physical which the Habs need more of, not less. 4. Habs aren't likely to have $4 Million players on a third line. Almost makes 3.25 seem reasonable. If the Habs were looking to deal with Winnipeg, not necessarily involving Kostitsyn, I suspect they'd have their eye on Paul Postma. Also on that list would be Patrice Cormier (a given to fill quota) or Bogosian, depending how it plays out. All that said, I like your blog and appreciate those who try to see the bigger picture. Plus, what's to dislike about Winnipeg being back in the NHL? I'd be wear of Kostitsyn. But perhaps you're right and he'd thrive out of Montreal just as his brother has in Nashville.